ENVIRONMENTALLY FRIENDLY- This tray is made of 100% recycled polypropylene plastic to be durable enough to handle daily exposure to water and dirt and to be environmentally friendly, protecting both your flooring and the earth. EASY TO CLEAN- The hard plastic easily rinses clean with plain water, and you can use a soft cloth to take care of more stubborn dirt deposits. Use another soft cloth to dry the tray thoroughly before the next use. 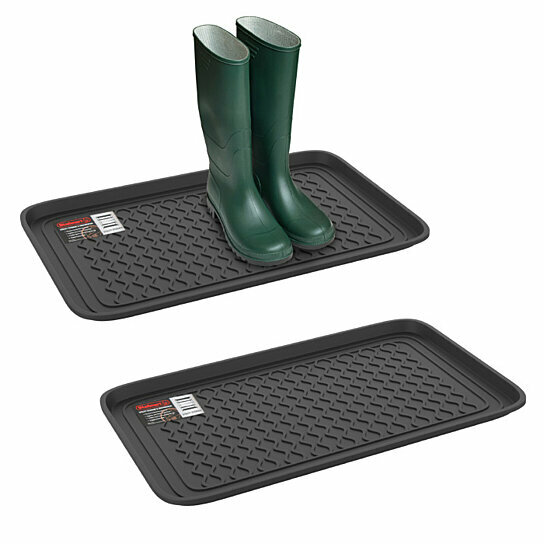 ALL WEATHER USE- This tray can be used both indoors and outside. Keep one in your entryway or mud room to catch water from rain or snow and every day dirt. You can keep one on your porch or deck to keep dirt and water from ever coming in your home. RAISED EDGE- You wont have to worry about accidentally tracking dirt and water through the house. The tray features a 1.25 inch raised lip which helps contain messes from every day dirt, pet bowls, cat litter boxes, potted plants, or paint cans. PRODUCT DETAILS- Materials: 100% Recycled Polypropylene. Dimensions: 23.7" L x 15.7" W x 1.2" H. Color: Dark Grey. Set of Two.